SpiceJet seems to be on the brink of securing an investor, suggested through subtle hints and a display of unusual confidence. RASK was driven by a 19% increase in load factor, which lead to a 12% increase in total RASK. RASK growth not proportional to load factor growth due to pricing stimulation which lowered yield. Lowered average yield, but made up for it in increased load. Proof of Concept: If yield reduction had actually hurt, then load factor increase would have been negated by the yield decrease, leading to a RASK reduction. Ancillary Revenue growth, contribution to total revenue increased by 1%. RASK negative fluctuations with season can be arrested through market stimulation and flying fuller airplanes. Q400’s contribution to passenger revenue, per ASK, is INR 4.99, 82% more than 737. October load factors dropped due to learning in progress and ongoing revenue model calibration. Cost is due to lack of funding. Fleet size dip has impacted schedules, airline expects to restore fleet to 31 by end of November and 35 by end of December. Concern over brand image impact, long or short term, due to cancellations and delays. Financial statement per ASK very encouraging. Not a cost plus business, as demand is elastic and varies with pricing. 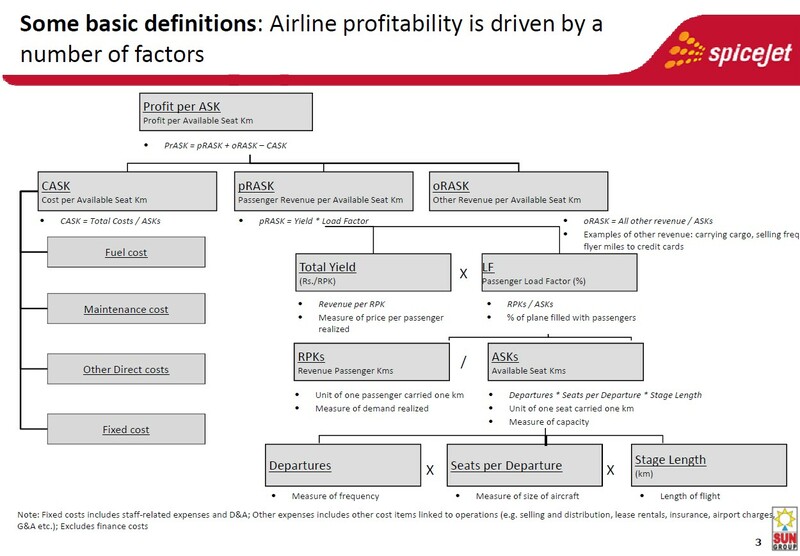 Breaking away from matching airfares, as impact on financial statement depends on an airline’s scale and cost structure. Stopped following the leader. Upto as much as 30-40% of an aircraft capacity is discounted on the lowest non-peak flights. As much as 1-3% on peak flights. Sanjiv Kapoor has been so disappointed by media reports about SpiceJet’s future (or the lack of it) that he decided to hold a class on airline economics, and answer most queries on the airline. This introductory class was complimentary – serving as a chapter on basics before slides full of numbers concerning SpiceJet’s performance flooded the screen. The interesting thing about this professor? He proudly displayed his airport entry pass (AEP). The class was off-airport. There were front benchers, and there were back benchers. There were those students who used their mobile phones in class, and those who snored away (eyes open, mind shut) during the lecture. There were those who diligently jotted notes, and then there were those who had questions on the subject before the subject matter was delivered. And then there were those who bunked the lecture, and those who knew not about the lecture, but were quick to comment. An airline commander, who, when made aware of the class, was ready to be quoted, said, ‘Statistics and numbers are like bikinis – they can hide the most interesting and important parts’. So much for the school gossip and classroom environment. Prof Sanjiv Kapoor, also the Chief Operating Officer (COO) of SpiceJet, was accompanied by Kaneshwaran Avili – Chief Commercial Officer (CCO), SpiceJet, and Kiran Koteshwar – Senior Vice President (SVP) Finance, & Acting CFO. Prof. Sanjiv is very good with words. He started the class saying that there was ‘no big announcement’ as most had anticipated. But he immediately emphasised the need for re-capitalisation. And he followed it very promptly with his inability to discuss anything as SEBI guideless prevent him from doing so. That very evidently hinted at something cooking. And followed that with the promise of an invitation titled ‘An Important Announcement Regarding Recapitalisation’ should there be such an announcement. Like every professor introducing himself to a class (to establish his credibility) before kicking off the talk, Prof. Sanjiv mentioned that he’s been in the airline industry for 20 years: both working in the airlines or advising airlines on turnaround, whether Malaysian airlines, Aeroflot, British Airways-Iberia, and the like. After a brief lecture on RASK & CASK (The class had no questions, implying either a 100% understanding or a 0% assimilation), Sanjiv talked about the airline’s figures. The slide above (click to enlarge) helps break down RASK and CASK, and that profitability is a difference between Cost per Available Seat Kilometer (CASK), and the sum of all the components that contribute to Revenue per Available seat Kiometer (RASK). He emphasised why its per ASK – because every ASK is an airline’s unit of production. “RASK was driven by a 19% increase in load factor, which lead to a 12% increase in our total RASK. Why is it not 19% increase in RASK? Because we drove the load factor increase through pricing stimulation. We lowered our average yield, and much more than made up for it in increased load. If our yield reduction had actually hurt us, then the load factor increase would have been negated by the yield decrease, and we would have had a RASK reduction. We had a 12% RASK increase, which means that the pricing stimulation helped our bottom-line straight. On top of that we had a 7% reduction in total CASK. That’s 19 percentage points”. The average fare in Q2’15 was INR 3,367, which is INR 344 less than Q2’14’s INR 3,711. However, the airline flew 3,525,086 passengers in Q2’15, which is 728,570 more than Q2’14’s 2,796,516. The product of average fare and passengers carried, between the quarters, leads to a difference of almost INR 150Cr. “RASK now, based on our intelligence is similar to other airlines- we’re closing the gap significantly, if it’s not identical. And if we continued this trend, RASK would be significantly under control, and it is driven by flying fuller aircraft and selling ancillary revenues, etc. When you discount a ticket and get one more passenger to fly, the passenger buys a meal, they have excess baggage – so the average revenue per passenger is not just his ticket, but it’s also in these areas that he spends. And that has helped ancillary revenues go up 31% year over year, even though the total revenue went up by only 15%”. We don’t subscribe to that big number of 31% (true, but doesn’t convey useful information). Ancillary revenue must go up when capacity goes up and passenger numbers go up. The presentation did not normalise the growth in ancillary revenue, which is not an oranges to oranges (or apples to apples : perhaps Sanjiv’s preferred fruit owing to the colour of the more popular varieties) comparison. Ancillary revenue, as part of total revenue (Pax Revenue + Ancillary revenue), went up 1%, YoY, to 10%, showing that there is a greater scope to drive up ancillary’s contribution to total revenue. “Philosophy is simple for us, and for most LCCs in the world. In the low season, you need to maximise your RASK by flying fewer empty seats. You use pricing stimulation. In high season, you use yield to maximise your revenues. You don’t want to use discounting as a major tool in high season. So high season, you’re willing to take a dip in load factors temporarily, because October is a surer season, and then make up for it in yields. So our decision to not do as much stimulation in October was a thought out decision and we knew that our loads are going to decrease, but the goal was – it doesn’t matter what’s giving you the RASK, load factors or yields- you want to maximise that. We felt that was a better balance for October”. Seeing the graph above, you’ll notice how RASK is highly season dependent, but its fluctuations can be arrested through market stimulation. In March, capacity increased at a greater rate than the number of passengers flown, and this – along with the low season – pulled the RASK down. In April, capacity was significantly cut, while the airline flew more passengers – the onset of the peak season, disfigured somewhat by the elections. This jumped up the RASK. In May – a very strong season, there were significantly more passengers who flew (green line), while the capacity dropped (red line), and this divergence, coupled with the strong season where airlines have the power to charge a lot more, resulted in a very high RASK. In June, when demand slumps, the RASK was affected, although the ratio of passengers to capacity remained unchanged. In July, August and September – Q2 – the airline continued to fly an increasing passengers to capacity ratio, but the RASK remained somewhat constant. 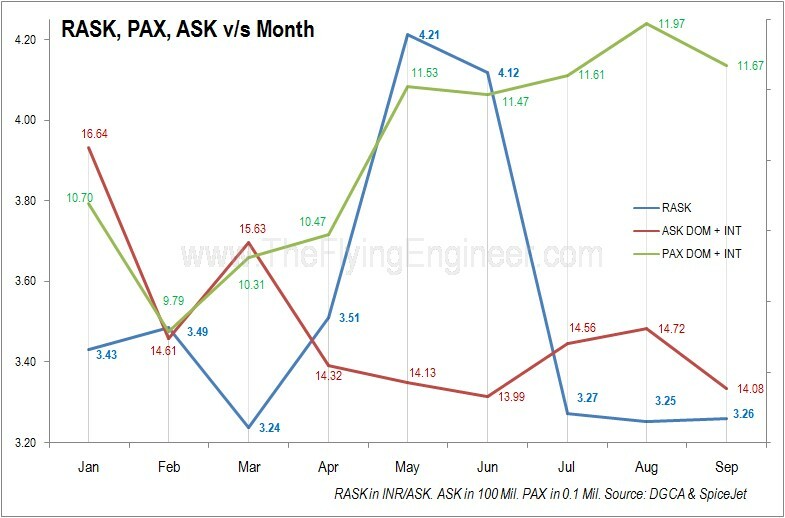 Historically, September is the worst month for travel, and yet, the airline’s RASK was maintained due to the stimulation. The effect? Arresting negative RASK fluctuations in sync with the months in a low season. However, the Prof’s argument for October seemed difficult to digest on two counts. One, Prof. Sanjiv had earlier said that “Airline seats are the ultimate perishable commodity. You can’t inventory in, and you can’t slow down to vary your production line. It just keeps coming at the same pace, And you have to sell it before it goes to waste”. 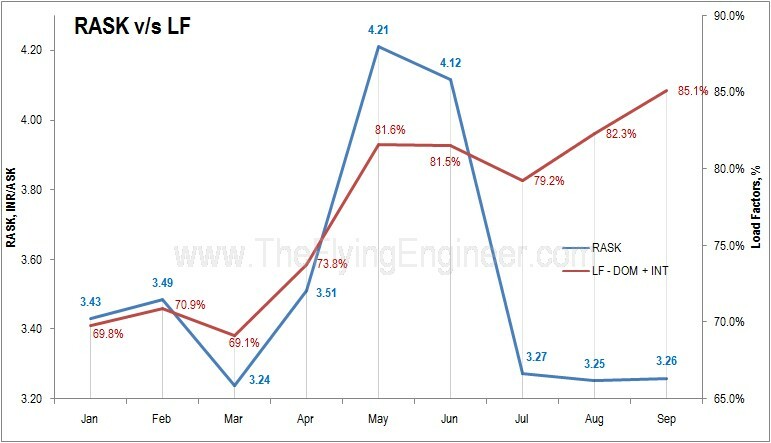 Two, the load factor for May – a season stronger than October, had higher load factors – 81.3% for domestic and 86.3% for international, resulting in a 81.6% overall load factor for the month. So, logically, you’d perhaps want to fly fewer empty seats (less than the 20% that went empty in October), and yet work with pricing so as to maximize yields. So why wasn’t the airline able to do this? “We are still in a phase of turnaround, and we have the database for the old model we operated in October last year. And we have added a lot of new flights. New sectors. So it still is a bit of learning curve for us as well. We took some assumptions where we can really maximise yield, and we stimulated lower. In the October of next year, we’d be much better. Same holds for the Q2 as well. Because now we have very solid data based on our new business model, which we can really exploit for the next Q2”. Prof Sanjiv added, “As Kanesh says, going forward, we will now calibrate our models again, so that we don’t fly empty seats in the high season. We’ve placed more of an emphasis on yields in the highs season. But that doesn’t mean we’ll fly empty seats. We made some assumptions about our yield and load balance, which turned out to be not exactly as perfect as we would have liked. Our goal is not market share, but profit maximisation or loss minimisation as the situation may be, depending on the season“. The Q400 fleet comprises of 15 aircraft on the books, of which 13-14 are active. In Q2, the Q400 contributed to only 8.13% of the airline’s total deployed capacity. However, the Q400 flies on Tier II and Tier III routes, and these routes – where there is either a monopoly or a duopoly – are where the airline can make money due to the lack of competition. With this, the passenger revenue (airfare revenue only) generated by the Q400 is INR 4.99/ASK, which is 182% of the Boeing 737’s INR 2.74. “Costs especially need to go down more. 7% is a good start. Costs tend to be sticky, because we’re in contracts – we’re in long term contracts, if you have payables like we have because of our accumulated losses in the past, then you can’t go to a supplier and say, ‘hey give me a reduction’. First they say, ‘first you clear out your dues, then we talk’. So costs take more time to take out of the system because of contracts we’re stuck in, and we actually need to pay money to reduce costs, and that will come with recapitalisation“. The management trio at the class agreed to the active Boeing (737-800 + 737-900) fleet size having reduced to around 26, though we have data to believe only 21 Boeing 737s are active as of 20th November 2014. Many aircraft have left the country, while some have been on ground without operating flights. Of these, one is in a C-Check, and another downed by the buffalo at Surat. Said Prof. Sanjiv, “We need to have scale. Dip (in fleet size) came because we are in the process of recapitalising. We are in the process of dropping all that affect us, and we got an opportunity to restructure our fleet and get rid of old aircraft“. This reduced fleet size has led to significant schedule changes, disruptions, cancellations, and delays. Prof. Sanjiv however stated that there is a plan to have 30-31 active Boeing 737s by the end of November, and around 35 by the end of December. He also stated that the airline’s Boeing fleet will touch 50 by the middle of next calendar year. 50 Boeings would mean 15 Boeings over and above the target for December, which would translate to around two 737s a month till the number 50 is reached. The question, however, in on whether SpiceJet’s staffing plan can effectively cater crew to man these equipment, on such short notice. 15 Boeing 737s need 75 sets of crew, which translate to 75 captains, 75 first officers, 75 senior cabin crew, and 225 other cabin crew. Staffing to cater to this requirement over 6 months will be a big challenge, though the airline seems confident. As for meeting flight crew requirements, Sanjiv mentioned hiring CPL holders, expat captains and internal P2-P1 upgrades as the way forward. Servicing cancellations involves money, as it will force the airline to either refund tickets or re-book passengers on other flights. If a good number of tickets were bought at a discount, then the airline may have had to rebook these passengers at higher fares, on other airlines. The cost involved in servicing cancellations, and the fall in revenue due to a smaller fleet, revised schedule, and loss of passengers seriously threatens Q3 profitability at the airline. The biggest concern, as we see it, is both the short term and long term impact on airline loyalty and high yield passengers such as corporates and businessmen, who buy the high-price tickets very close to the date and time of travel. For such persons, airline loyalty is way down the priority list – what is important are on time performance, low cancellation rate, timings, network and connectivity. Sanjiv and his team had worked very hard in bringing them to the airline, and building the brand, but the possible effects of the present state of the network may be concerning. Prof. Sanjiv however says the airline has dealt well with this issue. As for fuel and exchange rate, the airline enjoyed lower fuel prices and better exchange rates in Q2’15 compared to Q2’14. Average fuel price per litre was down 4%, and average exchange rate was down 3%. Based on earlier statements by the airline that nearly 70% of the costs are dollar denominated, we had estimated the airline has saved INR 31 Cr on dollar dominated expenses, and saved INR 31Cr on fuel expenses. This leads to an estimated saving of INR 62Cr. However, the airline states that the positive impact of YoY improvement in exchange rate and fuel price is INR 29 Cr. Further, last year witnessed an anomalous maintenance expense rise of INR 78 Cr due to increase in periodic eng maintenance, and bunching up of engines for a shop visit. According to the airline, this year witnessed a 75 Cr one-off and restructuring expenses. We have broken down the financials per ASK, as it is the unit of measure (see graph above). The airline recorded higher income from operations, per ASK due to market stimulation. Other operating income, which includes Income from wet lease of aircrafts. Aircraft fuel seems to have shot up, as in our previous analysis, we determined that flights on average were shorter, meaning more departures, and hence higher fuel burn (Of all flight segments, take-offs consume the most amount of fuel for a given distance). With a smaller active fleet, and higher aircraft utilization, lease rentals have dropped. Reduced overnight parking charges due to a smaller fleet, and volume based incentives have lowered airport charges. Last Q2 witnessed a very high maintenance bill – almost 125Cr more than Q1’14. Of this, INR 78 Cr was due to increase in periodic eng maintenance, and bunching up of engines for a shop visit, while the effect of the then expensive Q400 maintenance was also visible. Aircraft redelivery costs have very naturally increased, other operating costs largely unchanged. Although the salary hike of crew and other staff led to an INR 8Cr increase in the this quarter over last, the cost per ASK has remained the same, implying a better utilisation of crew. Other expenses, which also include crew transport and accommodation, have reduced, perhaps through better rostering to minimise layovers. Depreciation and Amortisation expense has both fallen in absolute numbers and per ASK (we consider this non-cash expense as non-opex). Total OPEX has fallen, and other income (not to be considered) has increased. Finance costs, however, have increased significantly, and contribute to almost INR 40 Cr. Prof. Sanjiv also shared some valuable insights into the industry, on why the airline didn’t perform as well last year, and why the early discounting and the last minute high fares kicked in. Sanjiv completed one year at SpiceJet on November 1st, and has perhaps learnt a lot about the Indian airline industry in this period. “When pricing is high, and demand becomes less than supply, then the market leader gets the profit- full, entirely. Because if there are three seats available for sale and only two passengers, then why would somebody buy a weaker product in terms of schedule, presence, strength – whatever-they would buy the market leader. So when fares were raised last year in September, by the market leader, and everybody followed, market leader went laughing all the way to the bank, rest of us were left bleeding. But we did not understand that this is a not a cost plus business. This is not a business where you can say, ‘Look, average cost is so much, all you have to do is raise your fare above that level, and you’ll make money’. Because there is an elasticity of demand to consider. In India, you raise your fares, demand falls. You have to balance it. And at the same time reduce your costs as much as possible. So what we started doing in January is, ‘look, we blindly can’t follow the market leader’s pricing’, and it is not a cartel – all over the world, because pricing is transparent – pricing is available to all, airlines tend to match fares. And the fares are usually set by one party and the other match it. We said, ‘we’re not going to do that anymore’, because we’re falling into the well while the other guys are flying over it“. (Airline industry is) Not a cost plus industry. Airline seats are the ultimate perishable commodity. You can’t inventory in, and you can’t slow down to vary your production line. It just keeps coming at the same pace, And you have to sell it before it goes to waste. If you’ve got the desire to sell the seats and not fly empty seats, sell it early. Sell it early at very good rates, attract passengers who are willing to book early- leisure passengers, occasional passengers, who may not be considering a trip but attract them. Do not discount at the last minute. Last minute passengers tend to be the least price sensitive – they’re the corporates and others who can afford to pay – there’s no point in giving them the benefit. Discount early and have less excess inventory close to departure. Or no excess inventory. Answering a question on how much of the inventory is discounted, Kanesh stated that for non peak flights, upto 30-40% of the aircraft, and for peak flights, upto 1-3% of the aircraft. Prof. Sanjiv closed with a teaser : that for the year following recapitalisation, the airline will do well enough to report a net profit on an annual basis. 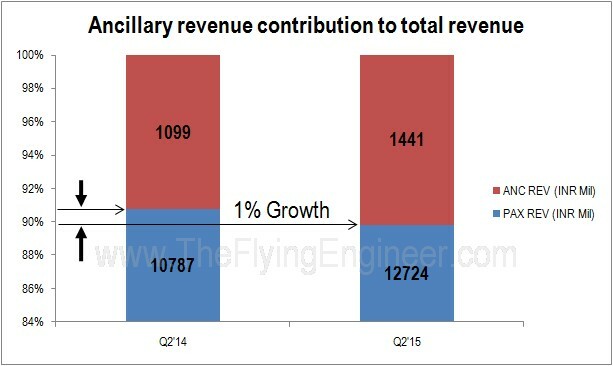 With the fairly open talk during the Q2 press conference, it does appear that the new men at the help of affairs at SpiceJet have both positively transformed the airline, and learnt about the industry (admitting to making certain estimation errors), and specifically – the airline’s position in the market. SpiceJet has in the past been plagued with too many high level management shuffles, exits, and entries, but it takes one solid year at least, to build solid data on how the industry works in a specific environment, with a specific model. We do hope that there will be no further management changes, as it will only serve to make SpiceJet a necessary lab rat year over year, impeding the airline’s ability to truly grow, sustain, and conquer. Great article. Very well written. I’ll have to read it to grasp it properly, but this felt like I was in the classroom. 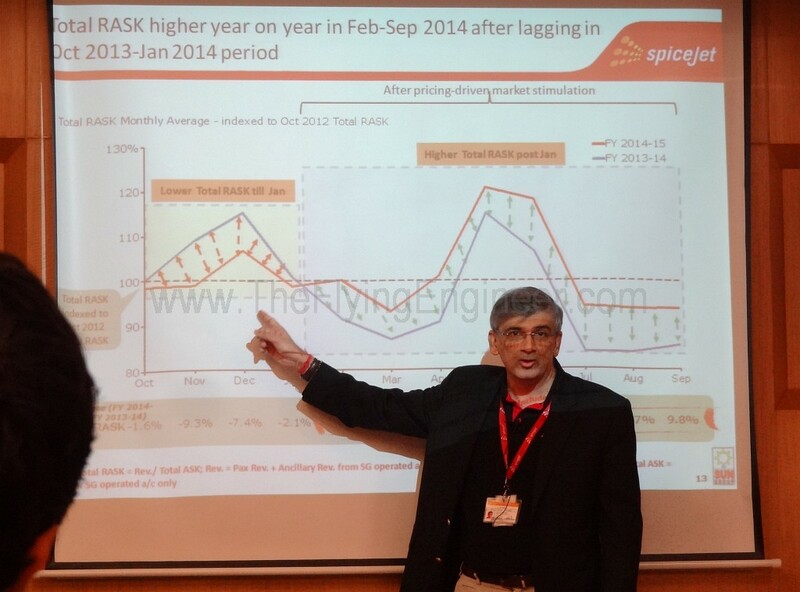 Any plans for a follow up article after the recent change in SpiceJet’s management and outlook.